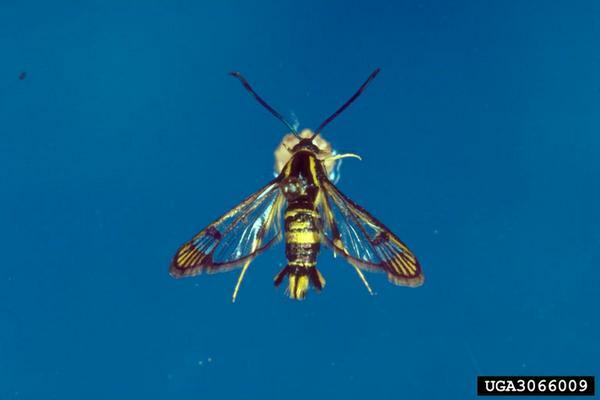 The dogwood borer (Synanthedon scitula; DWB) is a small clearwing moth native to eastern North America. In its larval stage DWB infests the trunks and branches of apple, dogwood, pecan, elm, hickory, and willow. 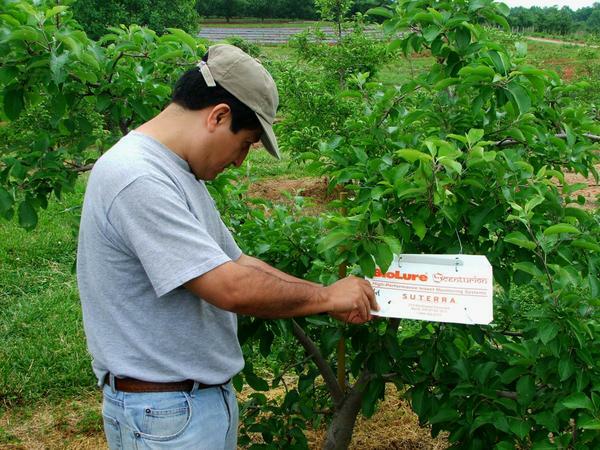 Apple trees grown on dwarf rootstocks are more prone to DWB infestation; therefore DWB has become a more common pest as many growers have transitioned to smaller trees. Adult moths have a wingspan of about 1 inch (25mm) and a black and yellow color pattern that makes them resemble small wasps. (The yellow band on the fourth abdominal segment is much wider on the female than on the male.) 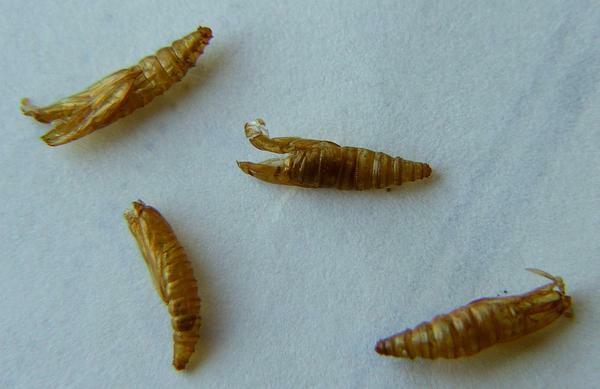 Pupae are brown and about 1/2 inch (12.5mm) long. Fully-developed larvae are also 1/2 inch (12.5mm) long, range from white to light pink, and have a dark brown head capsule. Eggs are small, ovoid, ridged, and usually laid singly in bark crevices. 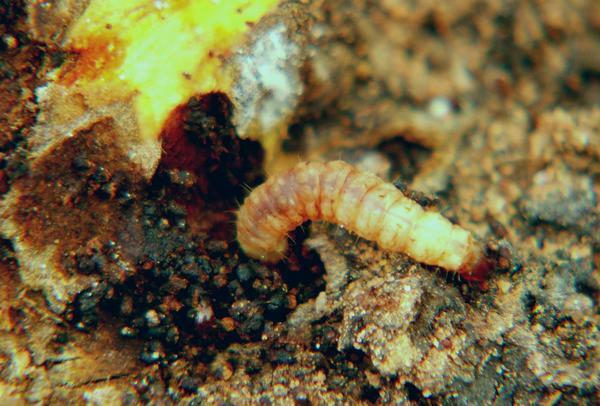 DWB overwinters as a mostly-mature larva that remains within a cocoonlike hibernaculum inside the feeding galleries of infested trees. In the spring the larva resumes feeding and then spins a silken cocoon that is covered with frass (debris or excrement). Adults emerge about 25 days later and begin mating a short time afterwards. Adults may be found from May through September. Females lay eggs on or near burr knots, which are aggregations of partially developed root initials that usually occur in clusters at or below the graft union. (The Malling and Malling-Merton series of rootstocks have a tendency to produce burr knots.) DWB seem to prefer trees that have already been infested. After 8 or 9 days, eggs hatch and larvae enter the burr knot. There is ongoing research into the specific life cycle of DWB in the southeastern US, as it is currently unclear how many generations occur in the region and how populations can be best monitored and controlled. 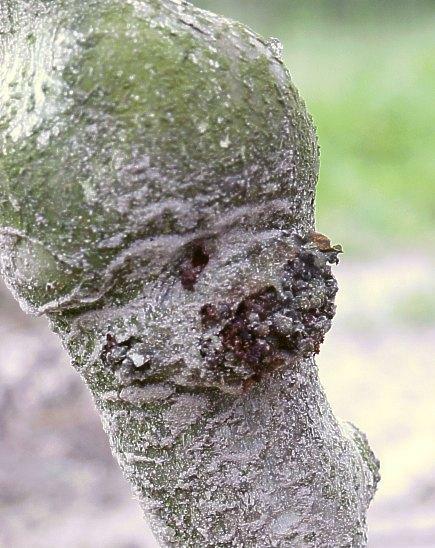 Burr knot on apple - favored site of DWB infestation. DWB larvae strongly prefer to feed inside the bases of trunks and in burr knots. The first sign of an infestation is the appearance of reddish brown, crumbly frass (excrement) on the surface. At times, golden pupal cases called exuviae may be seen protuding from the feeding site - a clear sign that adults have emerged, though old exuviae can remain on the tree for up to a year. 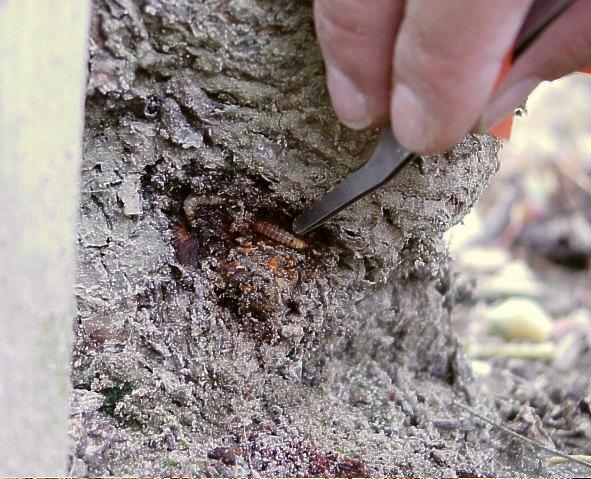 Feeding on burr knots usually does not harm the tree, although it may produce an entry point for disease organisms. 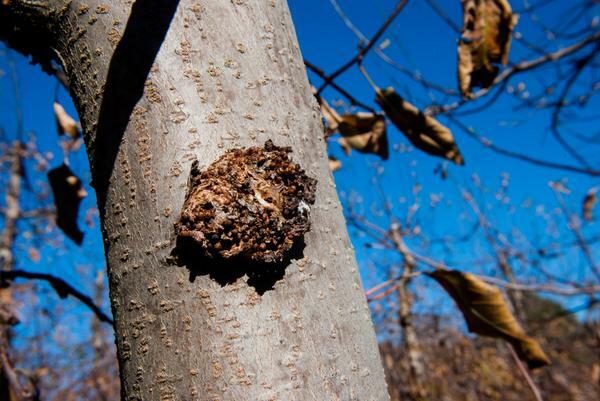 However, if larvae feed under the bark itself, the tree can become girdled and die. Usually there needs to be continuous infestation for several years before trees begin to show declining growth and reduced yields. Burr knot with frass visible. Frass and larva at feeding site. 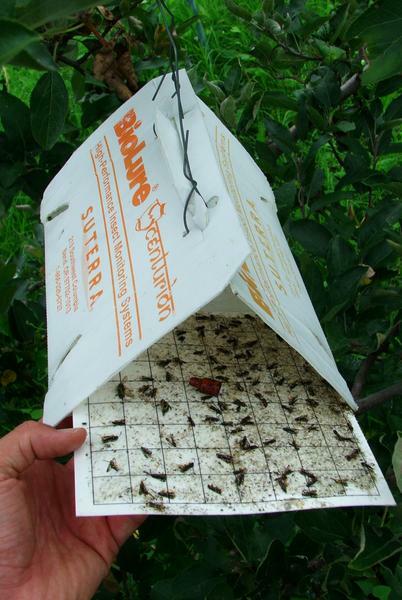 Pheromone traps can be used to monitor adult emergence. Traps should be placed about 4 feet (1.2 meters) above the ground; traps placed much higher or lower are considerably less effective. The number of burr knots (and therefore egg-laying sites) can be reduced with plant growth regulators such as NAA, but this is not always desirable since it will force any existing DWB larvae to leave burr knots and feed under the bark. Other borers may also attack the sites of dead burr knots. MM 111 is the only one of the Malling and Malling-Merton rootstocks to show any indication of resistance to DWB. 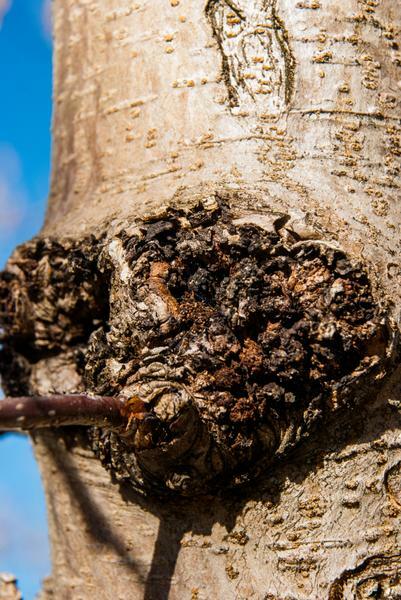 On any rootstock, painting the lower trunk with white latex before egg-laying begins can significantly reduce infestation levels, as can proper planting with the graft union close enough to the ground that existing burr knots form roots. DWB can also be controlled by trunk sprays with residual insecticides: usually, a single application at peak emergence provides sufficient control. All surfaces of the lower trunk and burr knots need to be wetted thoroughly in order for insecticide applications to be effective. DWB trap, hung approximately 4 feet (1.2 meters) above ground level.